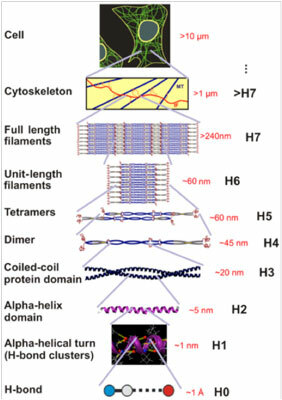 (Nanowerk Spotlight) In animal cells, the well known cytoskeletal proteins actin microfilaments and microtubules are accompanied by a third filament system that in humans consist of a family of more than 70 proteins. These fibrous proteins are absent from both plants and fungi, and have been linked to serious human diseases including cancer, muscle dystrophies and rapid aging disease. Their name, intermediate filament, was coined back in 1978 because their diameters – about 10 nanometers – appeared to be intermediate in size between those of microtubules and microfilaments. Although intermediate filaments have been discovered more than 30 years ago, their atomistic-level molecular structure remains elusive, and as a consequence, the understanding of the biological role in physiological and disease states is still in its infancy. More recently (in the past 10 years) the interest in intermediate filaments has increased substantially, and is now emerging as a major field of study in cell biology (due to the insight that intermediate filaments are critical in many essential cellular functions). One of the major issues that has remained unresolved is the source of the extreme stretchiness of this protein – it can be stretched up to 300% – which distinguishes it sharply from other cytoskeletal filaments. In fact, researchers in the 1990s termed intermediate filaments the safety belt of cells to describe their ability to provide strength and support to cells at very large deformation. Indeed, cells without (or with fewer) intermediate filaments lose their resistance to stretching. In a recent paper published in PLoS ONE ("Hierarchical Structure Controls Nanomechanical Properties of Vimentin Intermediate Filaments"), professor Markus Buehler and graduate student Zhao Qin from MIT and assistant professor Laurent Kreplak from Dalhousie University report a breakthrough in explaining the structural and mechanistic origin of the unique mechanical properties of intermediate filaments. By combining atomistic and molecular modeling with experimental studies, the researchers report a multi-scale analysis that showed that the mechanical properties of intermediate filaments are controlled by their characteristic hierarchical makeup. First, based on information about the genetically defined amino acid sequence, the authors have developed the first structural, three-dimensional atomistic model of vimentin intermediate filaments, validated against experimental results. To do this, they utilized a hierarchy of simulation techniques, ranging from atomistic models, molecular models, to coarse-grained models. Then, by using their new atomistic model, they have analyzed the mechanical behavior of intermediate filaments under stretch and validated the results by comparison with AFM experiments. Through these studies, the researchers have discovered that the characteristic mechanical properties of intermediate filaments are facilitated by a cascaded activation of deformation mechanisms that operate at different levels, from nano to macro. The mechanisms include breaking of clusters of H-bonds, a structural transition of proteins from alpha-helices to beta-sheets, and interprotein sliding. This is the first time that the deformation mechanisms of this protein have been directly visualized. Notably, the capacity of intermediate filaments to activate a variety of deformation mechanisms at different levels of applied strain enables them to combine disparate properties such as mechanosensitivity, strength and deformability, as each scale and associated mechanism contributes a particular feature to the overall properties. Through this merger of structure and material, any desired combination of functional material properties can be achieved. The impact of their study could be far-reaching, as the findings open the possibility for probing the effect of genetic mutations associated with diseases using in silico materiomics methods. This enables a new paradigm in studying biological and mechanical properties of intermediate filaments from an atomistic perspective that lays the foundation to understanding how properties of individual protein molecules can have profound effects at larger length-scales. The model could further enable scientists to study other biological functions associated with this protein, such as interactions with other cellular proteins (microtubules, actin), and different enzymes. From a nanotechnology perspective, the studies provide critical insight into new design solutions for synthetic hierarchical fibers or bulk materials. This could lead to materials that are similarly stretchy as intermediate filaments, but made out of carbon nanotubes or grapheme and are therefore much stronger. The key to develop these materials could be the design of cascaded mechanisms of deformation through the use of multi-level hierarchical structures, to achieve desired combinations of functional material properties.